Dust! Well it is the edge of the Sahara. It envelopes everything and gives a haze-like hue to all – including dusty djellabas donned throughout the day for visits to the mosque. Well that is the real Morocco, off the beaten track, not the marble of the tourist resorts and not the pristine white limewash you see in expensive clothes/lifestyle catalogues. Dust probably doesn’t sell so well! 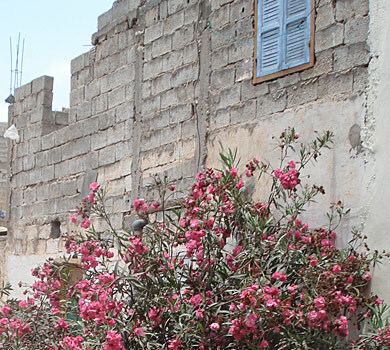 Even the bougainvillea and oleander are dusty. So the first thing you see in this pic, through the dusty haze, is probably bananas. Everyday life. 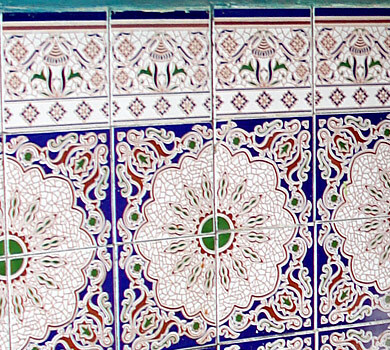 Look again and right here in the middle of it all – tiles, beautiful tiles often amongst the rubble and dust. Surrounded by water bottles, trays of soft drinks, bread and all and every bit of local produce. 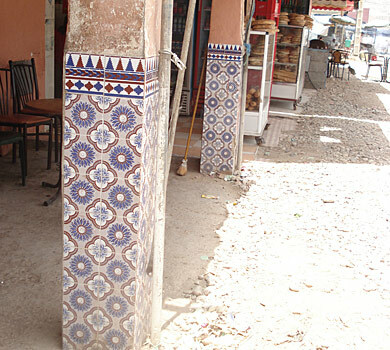 Rendered pillars, fairly rough and ready, but tiled beautifully. That seems to be the way of local life here, beauty amidst the every day and amidst what we might call unfinished, certainly unpolished and roughly hewn. But it goes deeper. Nothing is dressy on the outside, not in the local, non-tourist areas. These buildings appear almost as building sites, with walls just being built and barely rendered. We stayed in one of these houses (on the left). Open the heavy metal door and you are into a cool beautifully tiled stairwell, tiled up four flights of stairs (below left)! And each apartment tiled wall to wall. A rough exterior with jewels within. Reminds me of amethyst – looks like a normal old rock, but its cross-section reveals encrusted amethyst jewels within. 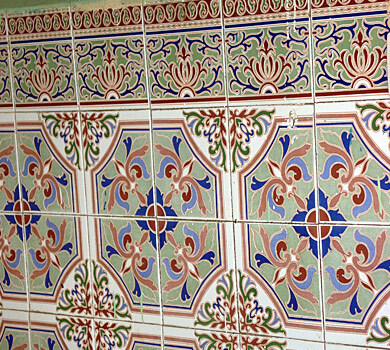 Tiled within – the hallway of our apartment. 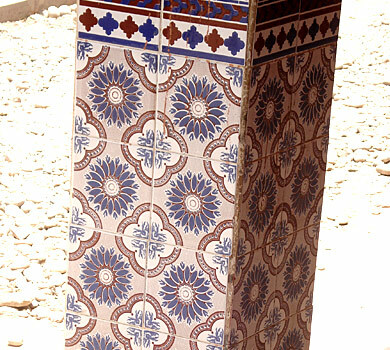 Modern Morocco does tiles! 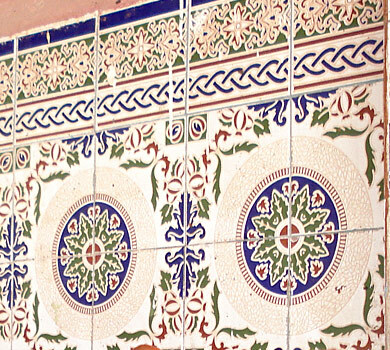 And here the local tagine eatery, beautiful old tiles have decorated this wall for years and years – for so long in fact they are a forgotten background. 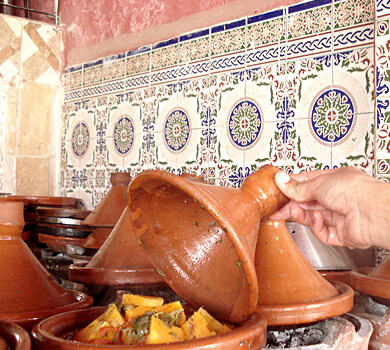 The tagines are pretty good too and our tagine man was very proud of them! I’ve always had a passion for pattern from early childhood. 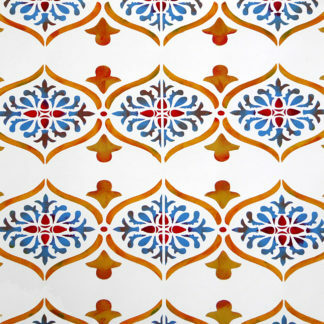 Fascinated with how pattern appeared particularly in textiles and ceramics. 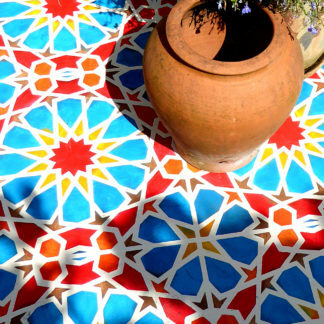 Pattern on everyday things tell a magical story through the ages and across the globe. I used to sit for hours as a kid drawing patterns of historical costumes, copying brocades, embroideries and woven patterns in opulent Tudor costumes! 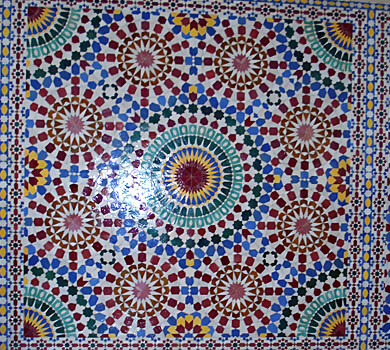 Or making studies of repeated tile patterns. The therapeutic effect of repeating little shapes over and over kept me occupied for hours at a time. Definitely the start of my love of detail, which you’ll see throughout my designs today. Pattern got me into printmaking early on – through lino, screen printing, stencilling and fabric and repeat printing processes. So I always enjoy the design process when its time to introduce more geometrics to the Motif Stencil Range – like getting together with an old friend! From early symbols, Egyptian hieroglyphs, where pattern was an early form of written language, to the development of swirls, shapes, rhythms and geometries – pattern in its own right. Different cultures developed their own styles. And like language there was a great intermixing and borrowing that went on. As people travel the world they pick up the influences of a place and leave their own behind them. So studying pattern I have always seen a range of influences within one style and the more you travel and look, the more you can see different influences peeking through. 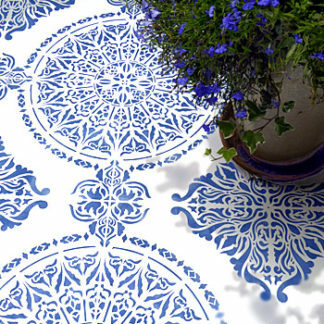 Ceramics and textiles have always been a great source for design motifs, where influences shine out. So studying them is always very rewarding and inspirational. 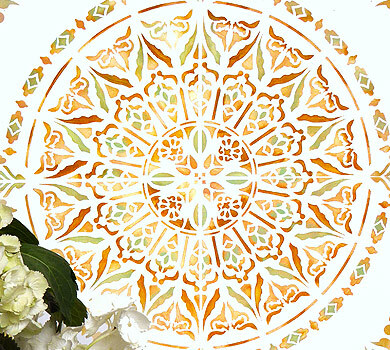 It was no surprise to me then that as I got into the Moroccan stencil design work that as well as clearly seeing Arabic and Islamic motifs I could see shapes and patterns synonymous with European Medieval and even late Victorian periods. 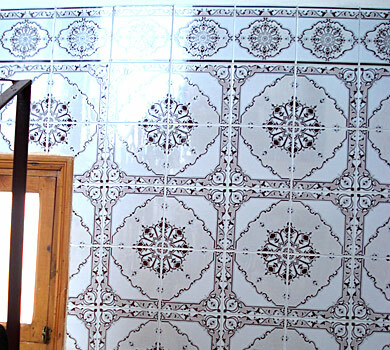 And the tiles used locally show many mixes of influences. Not so surprising when you consider the invasion of the Moors from North Africa and Morocco and the Medieval Crusades, and in later times European involvement in North Africa. Fascinating. Well I could go on about the history of migrating influences ostensibly for my blog, but it would end up more like a geo-political commentary and not a design blog! 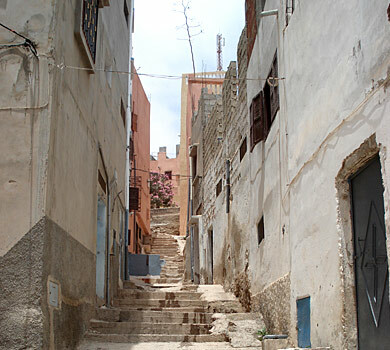 The Arabic for this region is Al-Maghreb meaning ‘where the sun sets’. 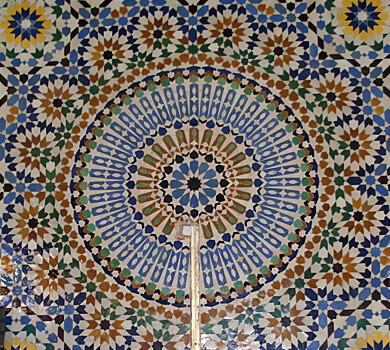 Interesting then that so many tile motifs are circular with many, many repeated sections radiating from a central point, just like sun mandalas. 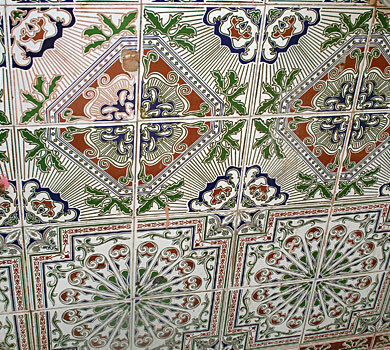 You see this motif again and again in many forms on old and new tiles. 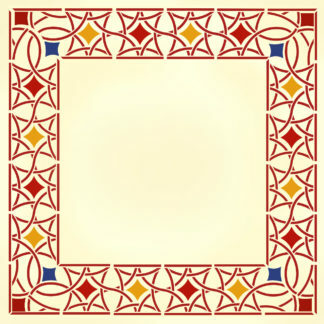 On single tiles and grand murals. 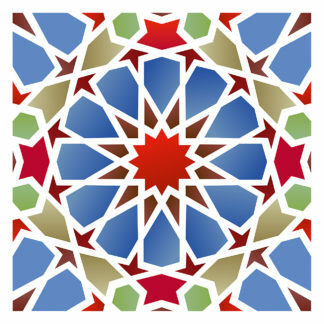 So too I based my tile designs on centrally radiating motifs with 8, 12 and 16 spokes or sections. There certainly is no denying the sun in Morocco! It is bright and very, very hot! 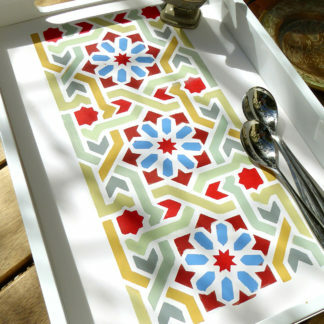 The Moroccan Arabesque Stencil and the Moroccan Ornamental Tile Design Stencils, part of the new Moroccan Range, both with radiating sun-like qualities. 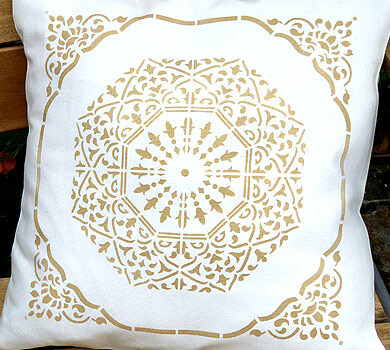 The Classic Moroccan Stencil with the radiating spokes of its central motif amidst interlocking lines. Our trips to Morocco have been great, soaking in different places, staying in the small villages, driving around, going back and forth on local buses. Might not be everyone’s cup of tea, but it is a great to get to know a place over a number of visits. 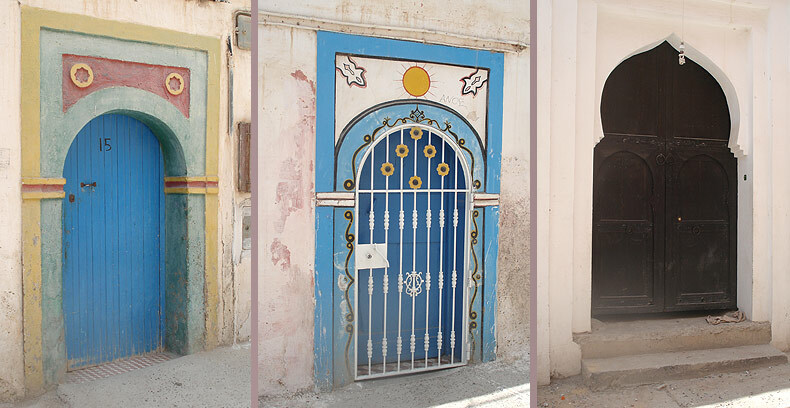 I loved these three doors, in one side street, next to each other. Plain walls, doors with colour and ornament that hint at the courtyards within. It certainly is a magical world and not ostentatious. Values are more internal, not showy on the outside. 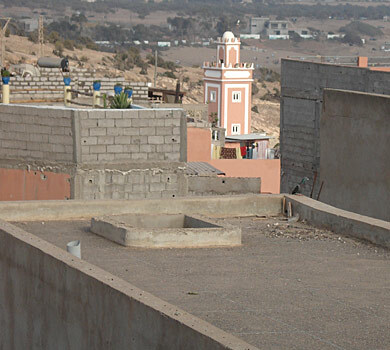 The local mosque in Morocco in the fishing village we stayed in (left). 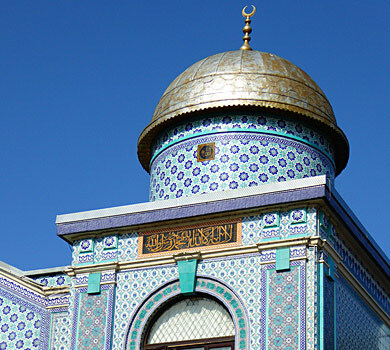 The local mosque on Kingsland High Street, Dalston (right) – tiles at home too and very opulent! And we did have some hot, hot days this summer in London too with clear blue skies!! So this journal is really notes about atmosphere, influences, motivations and inspirations, the triggers behind the design work in this new range. The design work itself was about being meticulous and fastidious, getting each and every shape as accurate as possible and in some instances still retaining a hand drawn look, whilst working on symmetrical shapes and circles with spokes at many different angles. To ultimately create as authentic look and feel as possible – true to my own experience and visual understanding! 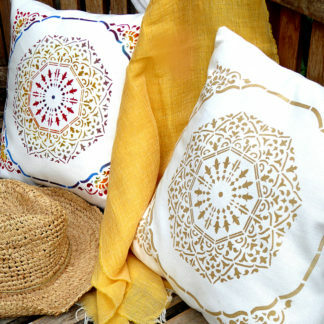 All Motif stencils, stencil designs, photographs, graphic images and text are protected by copyright and reproduction is strictly prohibited. 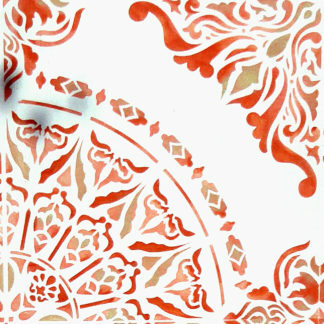 Henny Donovan stencils are sold for private usage only and may not be used for commercial projects or retail reproduction, or for any kind of resale or reproduction of stencilled images either photographically or for marketing, advertising or publishing of any kind. 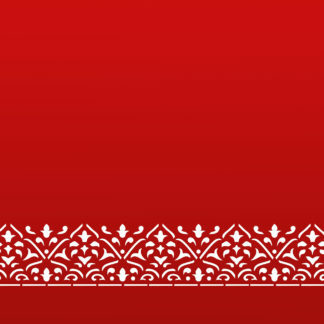 The stencil and graphic images on this website may not be used or reproduced for any kind of logo, letterhead, website illustration, advertising or other, either personally or commercially. If you have any queries relating to copyright or usage of Henny Donovan designs please use the enquiries form on the Information and Enquiries page.